Swedish social media visionaries like Anders Abrahamsson found themselves dancing alone for the first few years as their more practical compatriots waited for the field to mature a bit. However, Sweden now rivals the United States as the country with the most active Social Media Club chapters per capita, though the first formal chapter meeting was a mere two years ago. Sweden is proving to be a particularly fertile ground for the cultivation of social media. On the technology side, about 90 percent of the population has high-speed Internet access, and the country has a long history of communications innovation. Due to the “a phone everywhere” vision of telecom pioneers Lars Magnus Ericsson and Henrik Tore Cedergren, Stockholm in the 1880s had more telephones than Washington, D.C. Recently deceased Swedish electrical engineer Östen Mäkitalo became known as “the father of mobile telecommunications”—but not before being ridiculed in the 1970s for accurately predicting the wireless revolution. And we have Swedes to thank for coming up with Skype, Spotify and other innovations, prompting Wired UK Edition to name Stockholm one of the most vibrant European startup communities. On the cultural side, the Social Media Club in Sweden is leveraging a long tradition of in-depth people’s education, in which small circles of people share and spread knowledge wherever they go. Sweden was also the first country in the world to build a systematic census of its citizens and to have a constitutional protection of freedom of the press, and it also has a deep tradition of transparency in government. Additionally, the flattening effect of the social web—replacing closed hierarchies with overlapping networks—is proving a comfortable fit with Sweden’s relatively homogenous and egalitarian society. Eleven Social Media Club chapters now dot the Swedish landscape, which is roughly the same size as California but much more sparsely populated. And the chapter leaders are now breaking new ground by forming the first formal national Social Media Club federation outside the United States. “We’re trying to systematize the organizational process and make it easier for people who want to establish new chapters,” explains Abrahamsson, who founded Social Media Club Östergötland (Norrköping, Linköping), the first formal Social Media Club chapter in Sweden. The leading advocate of the Social Media Club in Sweden, Abrahamsson is an enthusiastic early adopter of technology who was lurking around online via Usenet in the early 1990s, long before the web interface made the Internet accessible to everyone. Abrahamsson thrives on change, but he wasn’t a nerd who liked technology for its own sake. Rather, he saw how the Internet in its web incarnation could flatten how we engage and do business, ultimately transforming society. “To me, the web was social from the start,” Abrahamsson says. “It’s a knowledge machine running a virtual seminar nonstop. And it’s a peace engine that hasn’t even begun to reach its full power yet.” Key trends for him include sustainability entrepreneurship (”sustainopreneurship”), a performative/descriptive conception of cause-oriented business that he has been helping to develop; and the ongoing transformation from a “structure society” to a “flow society.” (Read what Abrahamsson has written on these topics as a member of the global Social Media Club Editorial Team.) He also embraces the Open Space Technology and the World Cafe approaches to highly participatory and creative events and organizations. The mainstream wasn’t so quick to see the possibilities. Meanwhile, Abrahamsson was an early blogger who started dabbling with various social networks as they emerged: UK-based Ecademy in 2003, LinkedIn in 2004, and Twitter and Facebook in early 2007. He also staged the Norrköping edition of the first Twitter Festival (“Twestival”) on Feb. 12, 2009. It all really began in the midst of the last decade, when Abrahamsson was pointed to Social Media Club co-founder Chris Heuer’s “Noble Pursuit” blog, by Chris himself. The two had found each other by sharing circles of Open Space meeting enthusiasts and do- gooders through London-based global-networker-for-good Chris Macrae, and began establishing a relationship online. Abrahamsson thus followed the entire evolution of the Social Media Club, from its prototype days as Brainjam in 2005 to the global wildfire of 300-plus chapters it has become today. And he was on hand when Heuer, touring Europe in May of 2009 to promote the Social Media Club, detoured to Stockholm to give the keynote at a Disruptive Media Conference, sharing the stage with Social Media Club co-founder Brian Solis. This annual event is produced by Annika Lidne, who started up an independent Stockholm Social Media Lunch Club in 2008. 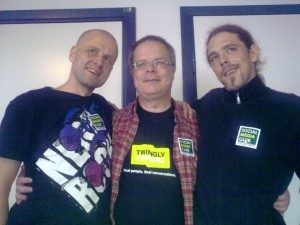 After the conference, Heuer and Solis gathered with Abrahamsson and Anders Sporring at a pub, where they brainstormed about developing the Social Media Club further in Sweden. Subsequently, a federal organization with a 3-person interim board was formed in December 2009, and held an organizational workshop in March 2010.
ves as a board member. The Social Media Club hosted a tent and a barbeque (#SMCBBQ). Following the lunch-time model of the independent club in Stockholm, the Social Media Club Östergötland (Norrköping/Linköping) chapter kicked off monthly lunch meetings in the fall of 2009, and established a Facebook page and Twitter account (@SMCOgtl). This seminal Social Media Club chapter in Sweden is a regional organization that pairs two highly complementary cities located about 40 kilometers apart in the Östergötland region: Norrköping, a former manufacturing center now in the midst of post-industrial transformation, and the high-tech center of Linköping. Additional chapters soon started popping up in other parts of the country. For organizational structure, Abrahamsson and his team stuck to the guidelines of the parent Social Media Club, and he encourages leaders of other chapters to do the same. “There are still some independent social media groups that haven’t become formal chapters—I believe they are afraid of the bureaucratic overhead this might entail.” But Abrahamsson sees this as false economy, because structure can help to provide continuity—something all-volunteer organizations with high leadership turnover need. This lesson was hammered home to the Swedish chapter leaders when Heuer returned to deliver the keynote at the Disruptive Media conference in March of 2010. While participating in the Norrköping @SMCSwe workshop the day after, he landed in the hospital and had to take a sudden health-related leave from Social Media Club activities. That left what could have been a huge vacuum in his place. In August 2009 the Swedish Social Media Club leaders joined the social web community at large in a spontaneous Social Web Camp that attracted some 200 people to southern Sweden’s Blekinge Archipelago, where the Swedish development further of SMC was fostered by introducing the organization in one of the opening slots of the unconference. Attendance doubled at the 2010 camp, where an expanded interim board and a nascent national organization were introduced. The board continued to expand, and held the first formal annual meeting of the national organization in May 2011. The 10-member board is now in the final stages of formalizing and registering the national organization as a legal entity in Sweden, in accordance with the national by-laws. Abrahamsson says this federal body is less for governance than for lifting some of the burdens off of local chapters, so they don’t have to reinvent the same organizational wheel over and over. For example, chapters will have a legal financial structure to lean on when dealing with cash flow, such as financial sponsorship of an event. The board also supports chapter development in general, and encourages the establishment of new chapters. Such duties encompass head-hunting for local social media pioneers in target cities who can form a team that will pick up the Social Media Club ball and run with it. This chapter support function is so central that it is included in the formal name of the national organization: Social Media Club – Chapter Support Association – Sweden / Sverige. “The goal is to establish the Social Media Club in strength across Sweden, and achieve critical mass,” states Abrahamsson. Then the national organization can provide a rallying point for partnering with other national groups and movements with similar goals. Though Sweden is already one of the world’s most-connected countries, 1.5 million Swedes say they don’t feel being a part of online world. This group includes a lot of elderly people, immigrants, long-term unemployed, and other marginalized citizens. Spearheaded by the non-profit foundation that runs Sweden’s .se Top Level Domain and has funds earmarked for Internet-development activities, Kampanj för Digital Delaktighet (hashtag #digidel2013) intends to bring a third of these people online by 2013. Abrahamsson would like to see similar initiatives flourish around the globe and work toward the Global Digital Participation (#digipart) goal. The Social Media Club, with its history as a cross-disciplinary and inter-institutional grassroots organization, can be a key facilitator for this process. Timing is important, so don’t be too eager to jump into things. You may need to dance alone for a while as you awaken your community. Put together a strong leadership team with complementary strengths, skills, and contacts. Community First! Focus on building a community. More than one Social Media Club chapter around the globe has imploded in the hands of an egomaniac with a private agenda. Leverage existing structures to limit redundant organizational overhead and establish a code of conduct. Meetings should be about quality, not quantity. If two people engage in intensive knowledge sharing over lunch and generate profound insight breakthroughs, that meeting has value and can advance the collective wisdom. Conversely, 100 warm bodies in a meeting room can turn into a me-too echo chamber with conference tourists regurgitating old insights.